Pages contains: burials, descendent tree, timeline, brewery & brewing notes, 2008 pics of ruins, maps. Possible surname analogs: Bilger, Billger, Bulger, Belger. Possible given analogs: Ignatz, Ignace, Issac. ...Born, 1828Jun30, born in Baden, Germany. ...1848Jun, Immigrated from Germany to Buffalo, Erie.Co.NY, age 19. ...1849, Went overland to the California gold fields. ...1852, Sailed from California to New.Orlean.LA; steamboat up the Mississippi River to St.Louis.MO, age 24. ...1852-1854, Engaged in the brewery business in St.Louis, learning more about the trade. ...1854 Moved from St.Louis to the brewery business in Milwaukee.WI. ...1857about, Moved from Milwaukee.WI (or Dubuque) to the brewery business in Ft. Atkinson, Winneshiek.Co.IA. ...1858about, Married probably in Winneshiek.Co.IA, Katherine Mary Kuthar b.1834/Wuerttemberg.Ger, d.Aft1897/?. 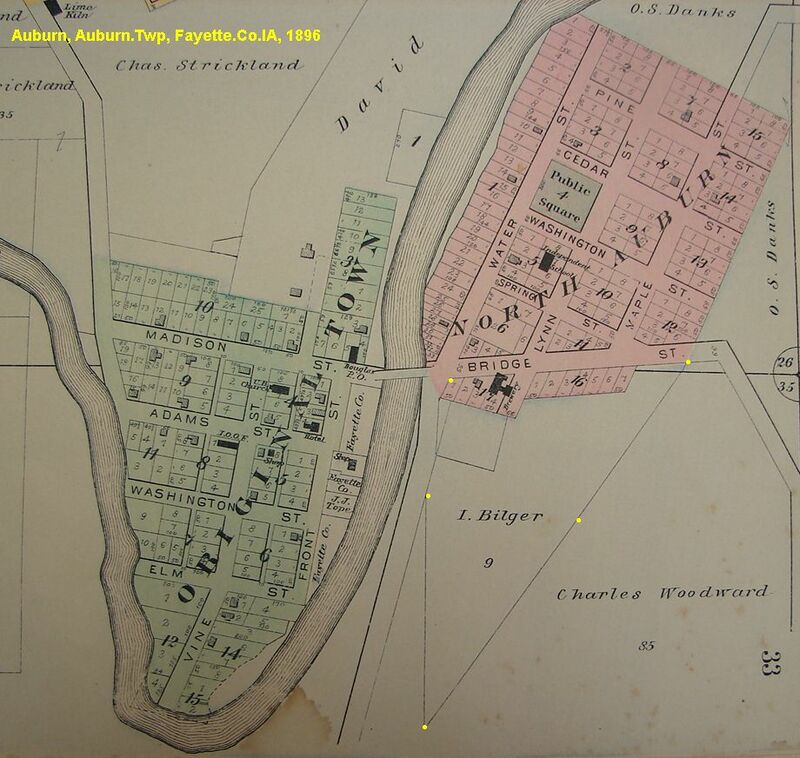 ...1858about, Started building a brewery in Bk17, N.Auburn, Auburn.Twp, Fay.Co.IA. ...1859, 1st child is born, Jospehine 'Josie' Bilger 1859-? (married James Thompson b.1851/Union.Twp, Fay.Co.IA). 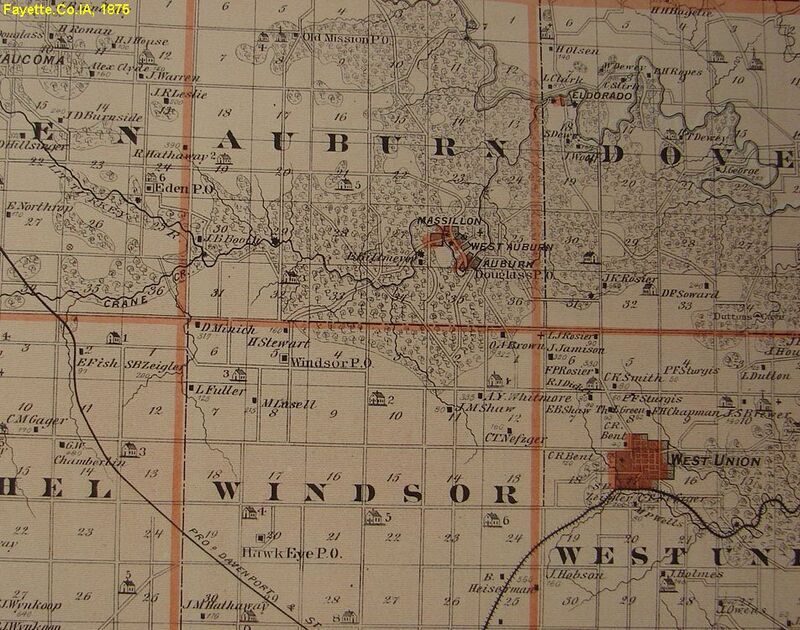 ...1860 Census: Bk17, N.Auburn, Auburn.Twp, Fay.Co.IA. Bilger: Ignatz33 brewer, $2k.200, wf Catherine25, dau Josephine1. ...1860, Adjacent is family of Hammond Andrus/Andreas33Baden brewer $700/100, Margaret34Wurtenberg, Wm2Wi. ...1861, 2nd child is born, Amelia Emma 'Amy' Bilger b.1861 (no other info). ...1862 US IRS Tax Assessment: Ignatz Bilger, 10 ¼ barrels of beer, rate $1/barrel, amount of tax $10.25. ...1862Sep09, 3rd child is born, Katherine 'Katie' Bilger 1862-1878Jan06, buried in Oak Ridge Cem, Fay.Co.IA. ...1863Jul20, NE of NE, ex.#1, sec 35, Ignatz Bilger bought from Walter Whitbeck. ...1863 US IRS Tax Assessment: Ignatz Bilger, 11 ½ barrels of beer, rate 60c, amount of tax $6.90. ...1864before, the size of the brewery grounds had increased substantially. ...1865 US IRS Tax Assessment: Ignatz Bilger, (appears beer production had increased to at least 24 barrels), 7hogs at 10c/hog, total amount of tax $25. ...1865Oct13, 4th child is born, George E. Bilger 1865-1926Sep20/Chicago, saleman/farmer, married Cora Unknown b.1872/ID. ...1866 US IRS Tax Assessment: Ignatz Bilger, 34 ½ barrels of beer, rate $1/barrel, amount of tax $34.50. ...1867, West.Union.IA paper: First quality of Beer & Lager constantly on hand. ...1867, West.Union.IA paper: Wanted 5k bls of barley, will pay port McGregor market price. Also fed out hogs & cattle on brewery by-products. ...1871Jul18, Part of N1/2 of N1/2 of S1/2 of NE1/4, sec 35, Ignatz Bilger sold to Reul Parker. ...1868, West.Union.IA paper: The Auburn correspondent toured Bigler's Brewery, the building is a massive structure of latest & most approved plans. ...1869, twins 5th & 6th children born, Charles F. Bilger, undertaker in Chicago, married Mary F. Watkins b.1872/Eng. ...1869, twins 6th & 6th children born, Elanora Laura Bilger, nothing more known. ...1870 Census: Auburn village, Fay.Co.IA. Bilger: Ignatz42 brewer, $30k/2k, Kate36, Josaphine11, Amelia10, Kate7, Geo4, Charlie1, Eleanoria1, Barney Heverly26 brewery worker. ...1870 Ag.Census: Igntaz Bilger; Horse Malt Mill, $1500, Barley4600bu@$2200; Hops 3klb@$600; Brewer, beer 1500bbls@$12,000. ...1870 - 1880 Iowa had 80-100 taxed brewers; the IA prohibition of the mid1880's 'ran' brewers & distillers out of business eliminating a local market for products. ...1878, Ignatz Bilger passes away, his Will leaves his wife Katherine in control of the brewery and all property until 1889 when she will get 1/3, and the children 2/3. ...1878 Ignatz's Will: Wf Katherine received control of brewery estate; in 1889, upon Elenora reaching age, 1/3 of estate to wf & 2/3 divided between children. ...1880 Census: Auburn, Fay.Co.IA. Bilger: Mary45 widow, Josephine21, Emma19, Geo14, Charles11, Elonora11. ...1881Jun27, NW1/4 in sec 36 & E1/2 of NE1/4 of NW1/4, Katherine Bilger bought from W.H. Dykins. ...1884Oct27, S2/5 of S1/2 of NE1/4 of NW1/4 & N3/8 of S1/4 of NW1/4, sec 35, Katherine M. Bilger widow sold to Martin Fels. ...1885 Census: Bk17, North Auburn, Fay.Co.IA. Bilger: MaryC51 widow, Geo20 day laborer, Charles17, Lora17. ...1885 Census: Louis Ostenberger, listed brewer, living adj to Mary Bilger, was likely running the brewery for the Bilger family. ...1886Mar25, S1/5 of NE1/4 of NE1/4 & NW1/2 of SE1/4 of NW1/4, sec 35, Catherine Bilger bought from W.H. Dykins. ...1889Apr15, W3/4 of NW1/4 of NE1/4, sec 35, Catherine Bilger sold to Luke Irving. ...1897Dec03, NW10a of NE1/4 of NE1/4, sec 35, Katherine Bilger widow sold to Nora Edison. 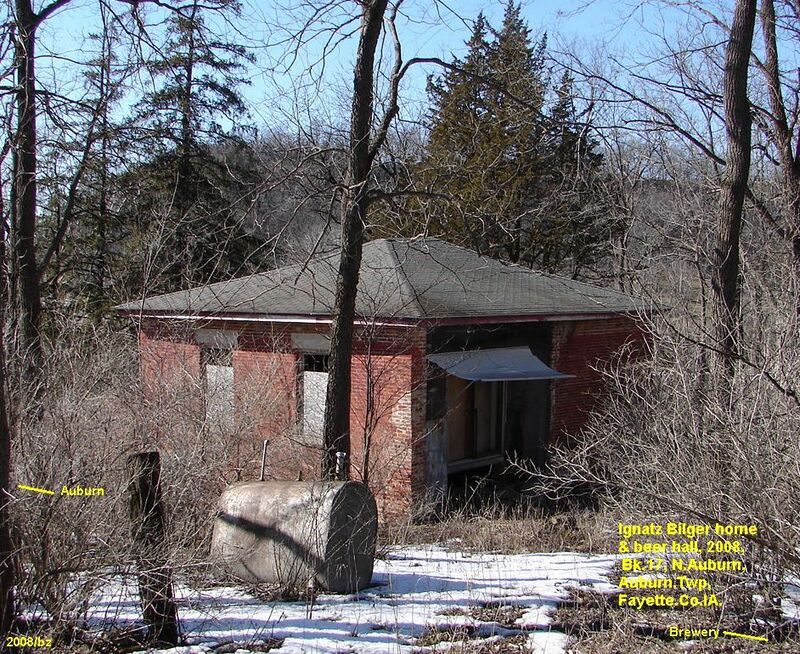 ...1898Jan, Blocks 12, 16, 17 and 6 ex lot 3, North Auburn, and NW10acres of NE1/4 of NE1/4, sec 35, Katherine Bilger sold to Nora Edison. ...1900 Census: could not find wife Katherine in 1900 census, possibly deceased bet. 1898-1900?, or had moved to lived with an adult child. bz/2012. Page Chronology: 2002, Started collecting some Bilger data; 2014Feb05, page initially uploaded; 2014May, contacted by ggSon Mike of Ignatz Bilger, refreshed page with updated tree and some Auburn village history. Bilger Ignatz Bilger Kuthar Mary Katherine 1834/Germany-.?/? 30 Jun 1828 17 Jul 1878 Oak Ridge Auburn Twp Row 1. Lot 25. Large white marble spire. CH: Josephine, Emma Amy, Katherine 'Katie', George A, Charles F, Eleanora Laura. Bilger Katherine Mary ''Katie' Bilger Bilger dau of Ignatz Sep 9, 1862 6 Oct 1878 Oak Ridge Auburn Twp Row 1. Lot 25. Age 16y27d. 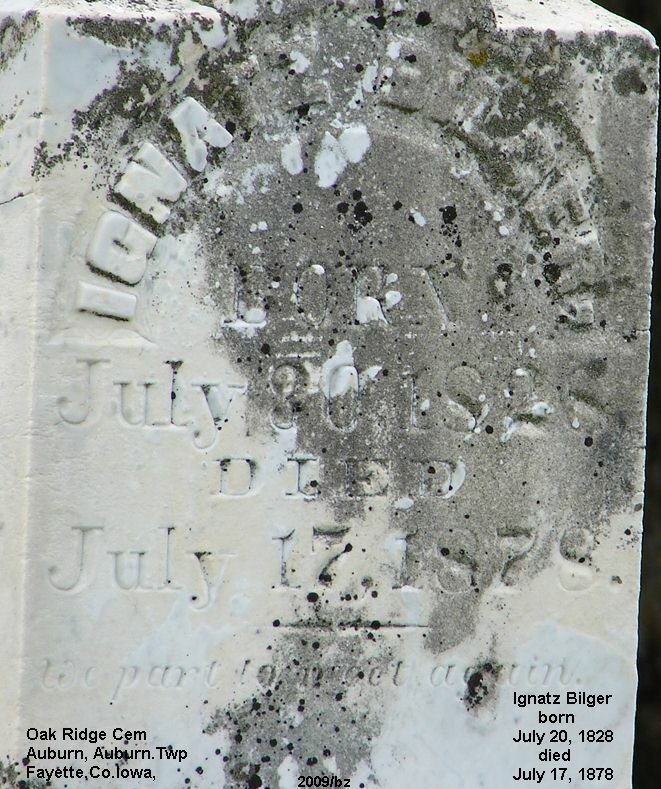 Dau of Ignatz Bilger 1828/Germany-1878/Auburn, Fay.Co.IA & Mary Katherine Kuthar 1834/Germay-?/? 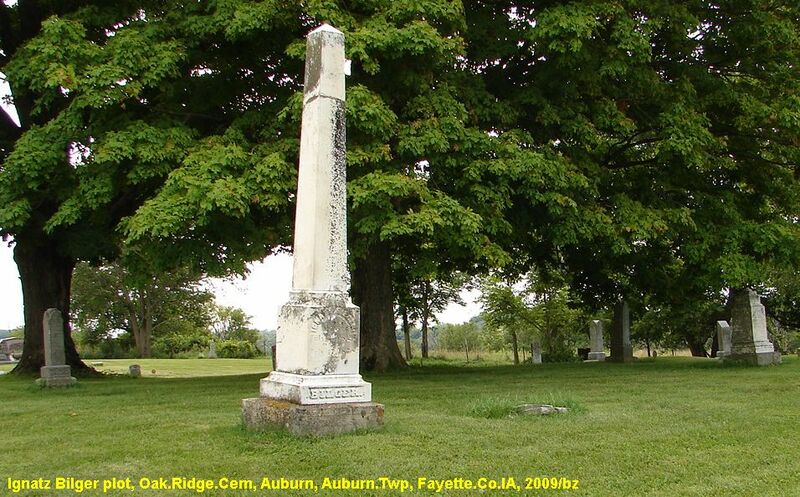 1 BILGER, Ignatz b: 30 Jun 1828 in Baden, Germany d: 17 Jul 1878 in Bk 17 brewery, N.Auburn, Auburn.Twp, Fay.Co.IA Burial: Oak Ridge Cem, row 1, Auburn.Twp, Fay.Co.IA Note 4: Jun 1848 Baden, Germany to Buffalo, NY, age 19. Note 5: 1849 Went overland to the California gold fields. Note 8: 1852 Sailed from Calif to Louisiana, up Miss.Riv to St. L, age 24. Note 10: Bet. 1852 - 1854 Engaged in brewery business in St. L, learning more about the trade. Note 11: 1854 Moved from St.L to brewery business in Milwaukee.WI. Note 12: 05 Mar 1855 Naturalized in Milwaukee, WI. Note 13: Abt. 1857 WI to brewery business in Ft. Atkinson, Winn.Co.IA. Note 14: Abt. 1858 Started building brewery in Bk17, N.Auburn, Auburn.Twp, Fay.Co.IA & married. 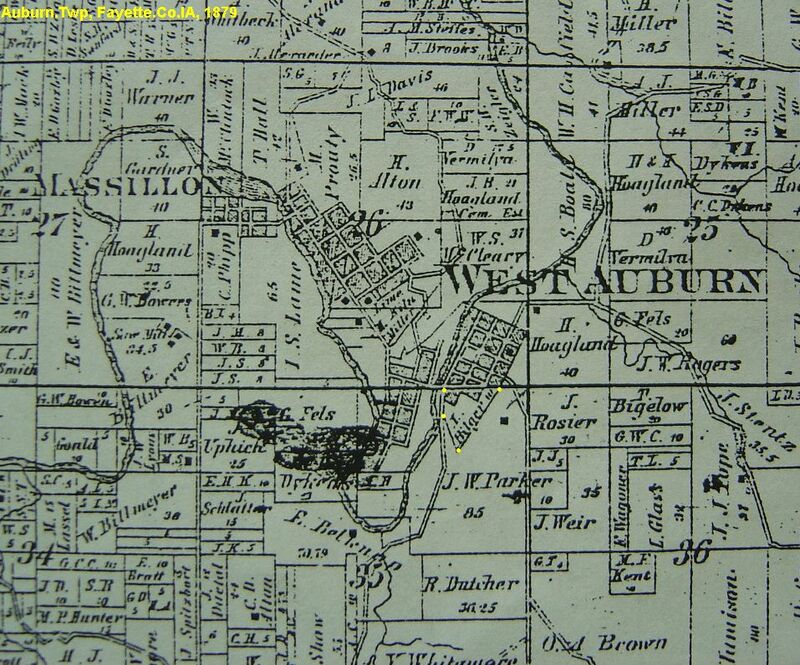 Note 15: 1860 Census: Bk17, N.Auburn, Auburn.Twp, Fay.Co.IA. Bilger: Ignatz33 brewer, $2k.200, wf Catherine25, dau Josephine1 & adj family of Hammond Andrus/Andreas33Baden brewer $700/100, Margaret34Wurtenberg, Wm2Wi. Note 16: Bet. 1862 - 1866 US.IRS.Tax: 1862=10.25 bls beer at 1$/bl; 1863=11.5bls beer at 60c/bl; 1864=11hogs at 6c/hog, 13.5bls beer at 60c/bls; 1865=7hogs at 10c/hos, beer $25; 1866=34.5bls beer at $1/bl. Note 17: 1867 Ad: First quality of Beer & Lager constantly on hand. Wanted 5k bls of barley, will pay port McGregor market price. Note 19: Also fed out hogs & cattle on brewery by-products. 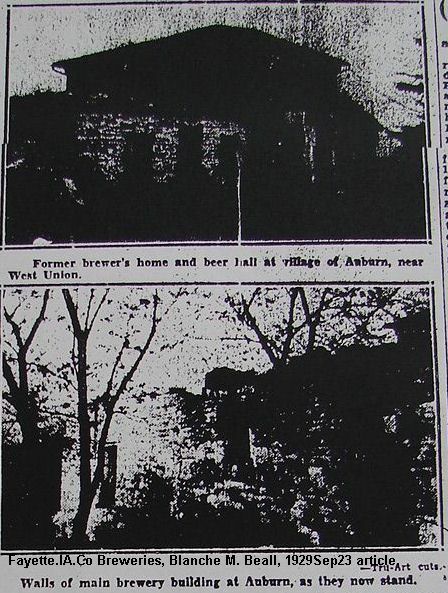 Note 21: 1868 West.Union.IA paper: The Auburn correspondent toured Bigler's Brewery, the building is a massive structure of latest & most approved plans. 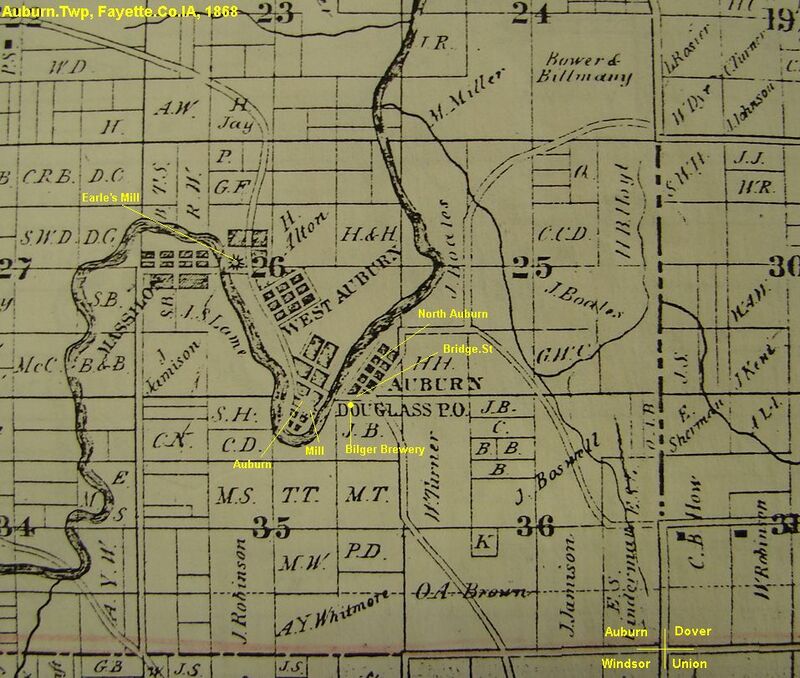 Note 23: 1870 Census: Auburn village, Fay.Co.IA. Bilger: Ignatz42 brewer, $30k/2k, Kate36, Josaphine11, Amelia10, Kate7, Geo4, Charlie1, Eleanoria1, Barney Heverly26 brewery worker; Hiram Belknapp70 family adj. 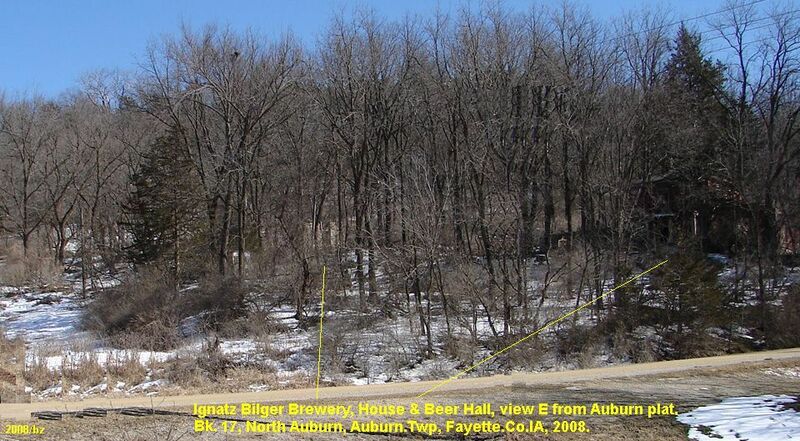 Note 24: 1870 Ag.Census: Igntaz Bilger; Horse Malt Mill, $1500, 4600bu@$2200; Hops 3klb@$600; Brewer, beer 1500bbls@$12,000. Note 26: Bet. 1870 - 1880 Iowa had 80-100 taxed brewers; the IA prohibition of the mid1880's 'ran' brewers & distillers out of business eliminating a local market for products. Note 27: 1878 Ignatz's Will: Wf Katherine received control of brewery estate; in 1889, upon Elenora reaching age, 1/3 of estate to wf & 2/3 divided between children. Note 28: Aft. 1878 Wife Katherine ran the brewery & business after husb's death. 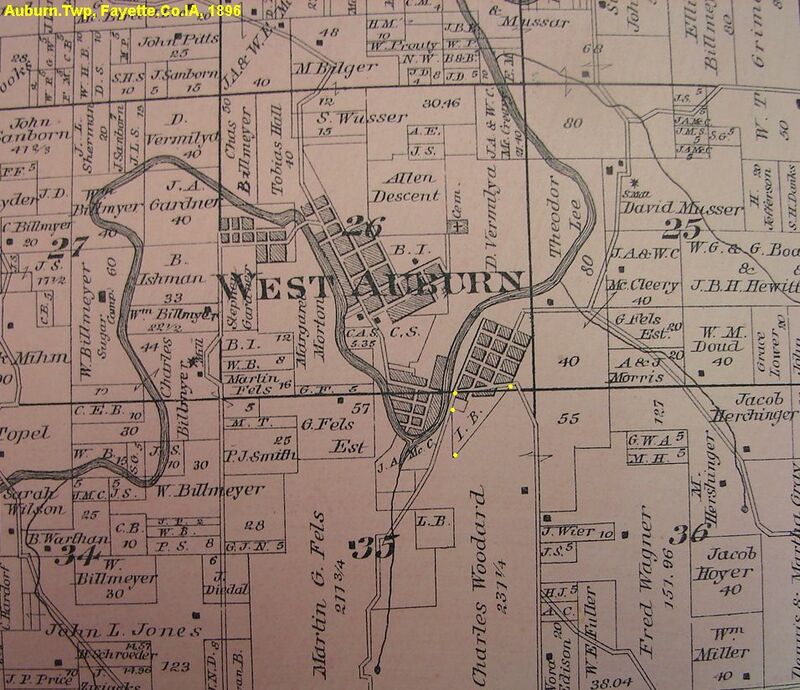 Note 29: 1880 Census: Auburn, Fay.Co.IA. Bilger: Mary45 widow, Josephine21, Emma19, Geo14, Charles11, Elonora11. .. +KUTHAR, Mary Katherine b: 1834 in Wuerttemberg, Germany d: Aft. 1897 Burial: Possibly unmarked with husb. at Oak Ridge Cem, Auburn, Fay.Co.IA? bz/2009. m: Abt. 1858 in Auburn?, Fay.Co.IA or Ft. Atkinson? Winneshiek.Co.IA. Note 11: 1880 Census: Auburn, Fay.Co.IA. Bilger: Mary45 widow, Josephine21, Emma19, Geo14, Charles11, Elonora11. Note 12: 1880 Ag.Census: 5 tilled, 1a woods, 30a unimproved, farm value $5k, live stock $300, $50 farm production, 3 horses, 5 cows, 3cattle, 2calves, 8 purchased & 9 sold, made 100# butter, 11 hogs, 28 poultry, 30doz eggs, 1a corn 20bu, Note 13: 1880 Ag.Census (con't): 6gal maple surup, 1a potato 50b, 1/2a apples 20trees 20bu val$8, val of forest products $40. Note 14: 1885 Census: Bk17, North Auburn, Fay.Co.IA. Bilger: MaryC51 widow, Geo20 day laborer, Charles17, Lora17. Note 15: 1885 Census: Louis Ostenberger, listed brewer, living adj to Mary Bilger, was likely running the brewery for the Bilger family. 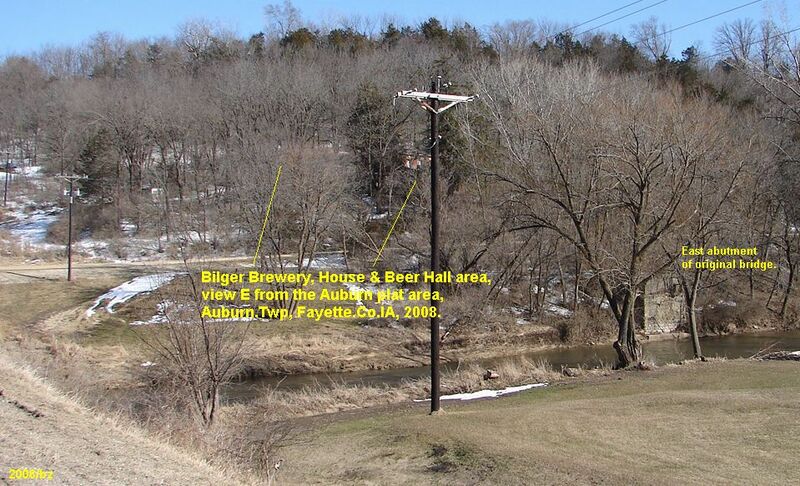 Note 22: Dec 1897 Last land transaction found for Katherine Bilger in Auburn.IA, bz/2009. Note 24: 1900 Census: could not find in 1900 census, possibly deceased bet. 1898-1900?, bz/2012. 2 BILGER, Josephine 'Josie' b: 1859 in Bk 17 brewery, N.Auburn, Auburn.Twp, Fay.Co.IA Note 9: Abt. 1885 Moved to Albert Lea, MN, shortly after marriage. .... +THOMPSON, James b: 1851 in West Union, Fay.Co.IA m: 13 Apr 1884 in Auburn, Auburn.Twp, Fay.Co.IA. Father: George THOMPSON Mother: S. KELLY Note 9: Saloon keeper in Albert Lea, Freeborn.Co.MN, at time of marriage. 2 BILGER, Amelia Emma Amy b: 1861 in Bk 17 brewery, N.Auburn, Auburn.Twp, Fay.Co.IA Note 9: 1881 Emma took over Mrs. M.A. Glimes Millinery & Fancy Goods on Main.St, West Union, Fay.Co.IA. 2 BILGER, George E. b: 13 Oct 1865 in Bk 17 brewery, N.Auburn, Auburn.Twp, Fay.Co.IA d: 20 Sep 1926 in Chicago, Cook.Co.IL Note 8: 1888 IL.Voter Reg: in Chicago, Cook.Co.IL. Note 11: 1910 Census: Cottage.Grove.Ave, Chicago, Cook.Co.IL. Bilger: GeoE44 store salesman, Corac38, lodger Albert S. Niedlinger 22 theater electrician. 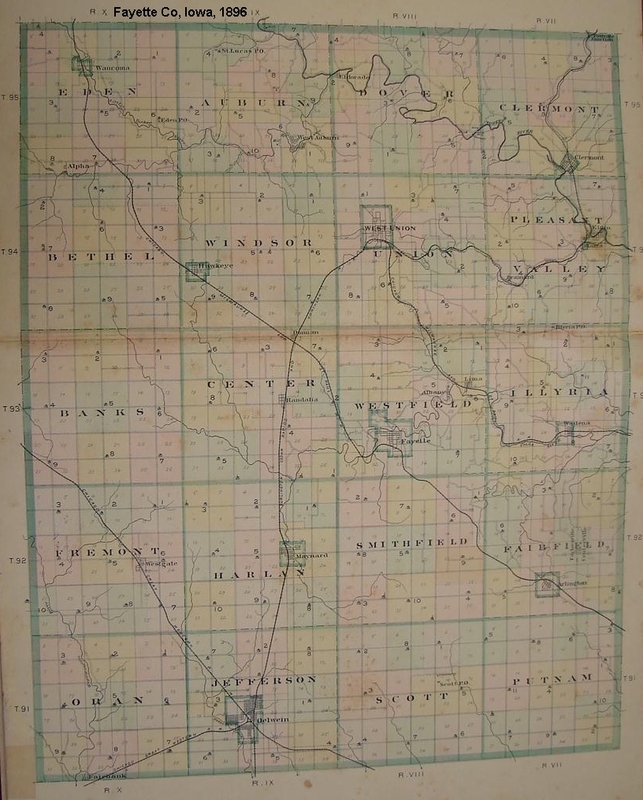 Note 13: 1920 Census: Salmon River, Challis, Custer.Co.ID. Bilger: GeoE53 farming, Cora47. .... +UNKNOWN, Cora C. b: 1872 in ID d: Aft. 1940 in MA? Father: UNKNOWN Note 8: Father b.MI, mother Canada. Note 12: 1940 Census: Mill Pond Rd, Truro, Barnstable.Co.MA. Clase E. Lombard66 wid & sister Cora A. Bilger67 wid. 2 BILGER, Charles Frederick b: Oct 1868 in Bk 17 brewery, N.Auburn, Auburn.Twp, Fay.Co.IA d: Aft. 1930 in Chicago, Cook.Co.IL or Winnebago.Co.WI? Note 9: 1892 IL.voter Reg: in Chicago, Cook.Co.IL. Note 11: 1900 Census: Lake.Ave, Chicago, Hyde.Park.Twp, Cook.Co.IL. Bilger: CharlesF31 undertaker, MaryF27, GeoW4, HellenA11m. Watkins: m/law Eliz61, Rose24, AblertE16. Note 15: 1910 Census: Lake.Ave, Chicago, Cook.Co.IL. Bilger: CharlesF40 undertaker, MaryF37, GeoW14, HelenA10, CharlesF7, b/law Albert Watkins26 clothing salesman, ThomasW Riley45 undertaker helper. Note 17: 1920 Census: Lake.Ave, Chicago, Cook.Co.IL. Bilger: CharlesF50 undertaker, Mary48, Helen20, Charles16. Note 21: 1930 Census: Lake.Ave, Chicago, Cook.Co.IL. Bilger: CharlesF27 undertaker, CharlesF58, Mary55, Albert Watkins45 embalmer. ... 3 BILGER, George William b: 13 Oct 1895 in Chicago, Cook.Co.IL d: 09 Jun 1955 in Winneconne, Winnebago.Co.WI Burial: Winneconne Village Cem, Winnebago.Co.WI Note 8: 1920 Census: 54th St, Chicago, Cook.Co.IL. Bilger: GeoW24 manager Bilger funeral home, Irma26. Note 11: 1930 Census; Park.Ave, Chicago, Cook.Co.IL. Bilger: GeoW34 proprietor undertaking parlor, Irma34, GeoW6. Note 14: 1940 Census: Park.Ave, Chicago, Cook.Co.IL. Bilger44 proprietor undertaking parlor, IrmaR44, GeoSW16. Note 15: 1942 Draft.Ret: 5205 Lake Park Ave, Chicago.Cook.Co.IL. Charles F. Bilger & Sons Furneral Home. ... 3  BILGER, Helen A. b: Jun 1899 in Chicago, Cook.Co.IL d: 1967 in Muskegon, Muskengon.Co.MI Note 11: Bef. 1929 Divorced from Raymond F. Delano. Note 12: 1930 Census: Muskegon, Muskebon.Co.MI. Wood: HaroldA29 funeral director, HelenA30 & dau Mary jane Delano9. Note 14: 1940 Census: 1751 Aerk.St, Muskegon, Muskegon.Co.MI. Wood: Harold39 funeral director, HelenA40, MaryJ19 shipping office stenographer. ... 3 BILGER, Charles Fredrick b: 01 Feb 1903 in Chicago, Cook.Co.IL d: Apr 1978 in Edgelwood, Arapahoe.Co.CO Note 22: 1978 Last SS benefit, Muskegon, Muskegon.Co.MI. Note 23: 1978 Last residence, Englewood, Arapahoe.Co.CO. Article: 'Old Fayette Country, Early Auburn,' Elgin.IA paper, 1896Sep03. ...One visiting the town of Auburn which has never enjoyed the distinction of having a post office of its own name, the name of the same having always been Douglass, would have little idea of the prominence which attached to that town in the early days of Fayette County. ...The first dwelling erected at Auburn, was that of James B. Earle, built in 1849 and in that year he commenced the erection of a saw mill on the banks of the Turkey river and afterward built a grist mill there, and in 1851, a flouring mill in which the first grist was ground in Sept. 1851. Prior to that time the people of Fayette and the southern part of Winneshiek County , had been compelled to go to the mill at Elkader in Clayton.Co. Earle's Mill afforded them facilities which caused them to feel that they had almost all needed advantages at their door. ...James B. Earle was assisted in his undertaking by his sons Morris B. Earle, Hiram W. Earle and Nehemiah B. Earle, all active men. 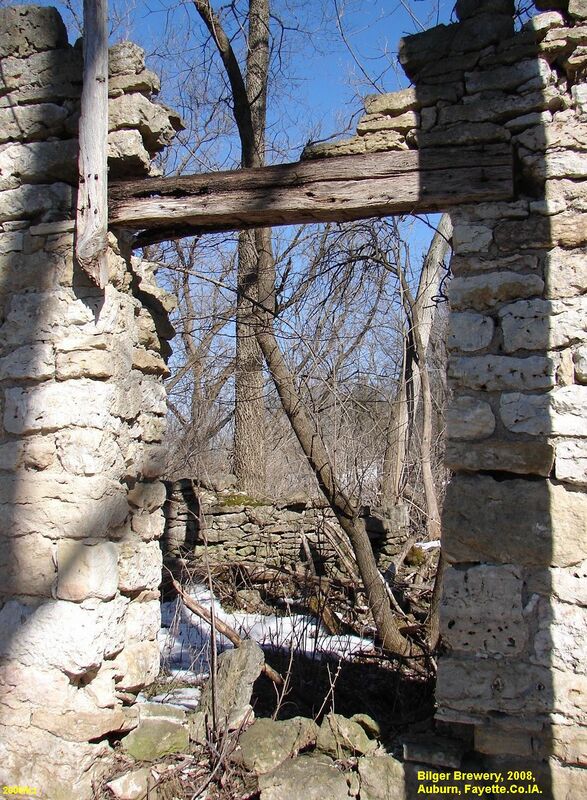 Their mill became the pont at which the grinding of grain was done for the counties of Fayette, Chickasaw, Howard, Mitchell and territory in Minnesota, extending as far as the town of Austin. ...In about 1851, John A. Griffith, a nephew of James B. Earle, located in Auburn, also Samuel Hull, Hiram Hoagland, Hull Hoagland, James Boale, S.D. Helms, plus some others. ...In connection with the mill, the Earles established a general store. Hoagland erected a cabinet shop and started a turning lathe (powered by the mill), and furnished most of the chairs and bedsteads for the early settlers. The Earles are now (1896) all dead. Morris B. Earle having died only a short time since at Lamar.MO. They were all active, enterprising business men and for those times did an immense amount of business. Nearly every person that came to mill with their grists also patronized their store and they soon became known far and near as honest, square dealing men with whom it was for the benefit of the people to do business. ...The Earles continued business until the panic of 1857, and made a large amount of money, but having done a large credit business, when the hard times came, those in their debt were unable to pay for the goods which they had bought upon time and the Earles were unable to meet their obligations, consequently failed. ...John A. Griffith, who was associated in business with the Earles, removed to Fayette village, and was there engaged in the dry goods trade, was post master of the town, and became a prominent man, but he also failed. ...Hoagland, in company with James Boale, established a dry goods store at Auburn, a little later, and did a good business in the same, and afterward purchased a large farm in the Auburn.Twp, was for several years member of the Fayette.Co board of supervisors, and died universally respected. Of all those whom we have names, Hull Hoagland, is the only one still living. 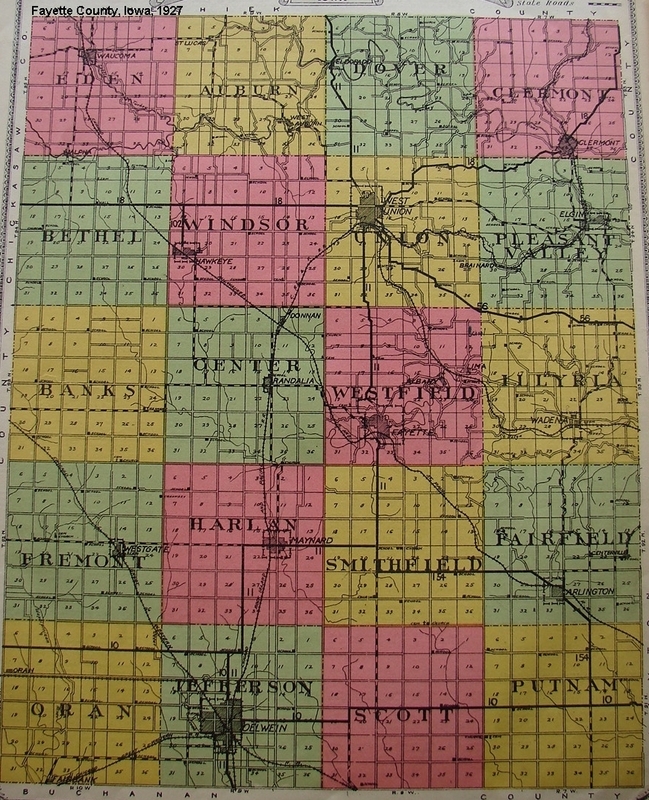 he left Auburn and located at Oelwein, several years ago, engaged in the mercantile business with John Jamison, who is now a banker in Oelwein, did a good and prosperous business, and finally having a daughter who was located at Emmettsburg, he sold his interests at Oelwein, and is now located at Emmettsburg. ...In 1851, Z. McGunkin built a hotel in Auburn, the Iowa House, which is still in very near the same condition it was when first erected by him; it was afterward purchased and owned by Edson & Hill. ...A drug store was opened about 1853, by A.L. Dunn & Bros.
...Ignatz Bilger built a brewery which was afterwards enlarged and at one time worth $10-15k, but now stands as an illustration of the effects of the prohibition laws within the state. ...The first school house in Auburn was erected in 1854 and was the best school house in the county. It has long since been superseded by a brick building well constructed and of a capacity for a large number of pupils. The old school house still stands however. ...Black smith shops, clothing store and tailoring shops and other business places were erected and occupied in Auburn in 1853-1855. 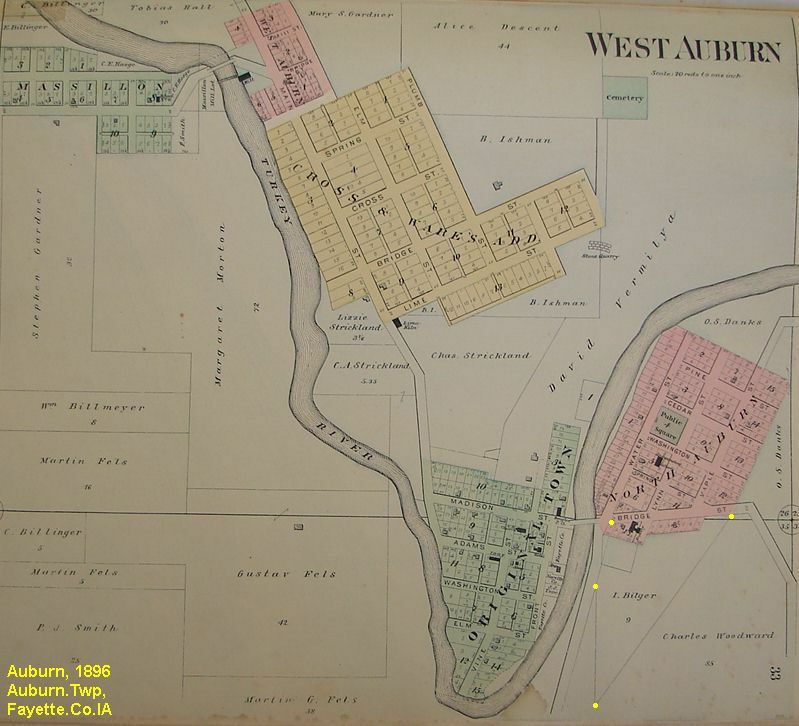 In 1855, Auburn was the most business point in the country doing then a much larger business than did West Union, which was the country seat. ...The mills drew people, and its business men by being reasonable in their prices and accommodating to their customers, held all trade to which they were entitled and acquired some which would naturally have belonged to other points. ...Auburn's first doctor was Dr. Ware, and he was succeeded by Dr. W.A. Chase. 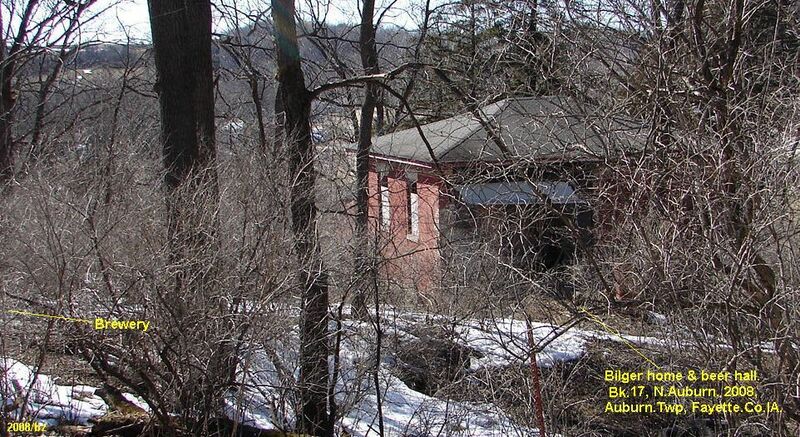 ...Another saw and grist mill was built at West Auburn within a half mile of the village of Auburn. (Note: this was Earle's mill, the first grist mill in the area, thus paper editor is confused with some points of history). The mill is still in operation conducted by Charles Haege. James Austin, we think, was the builder of that mill (incorrect, he build the mill just upstream from the Auburn bridge and across from the brewery) and ran it for several years during the time a controversy arose between him and the owners of the mill at Auburn, regarding the water power. Austin claiming that the lower mill backed the water on to him. It was a closely contested case both parties spending considerable money in the contest. 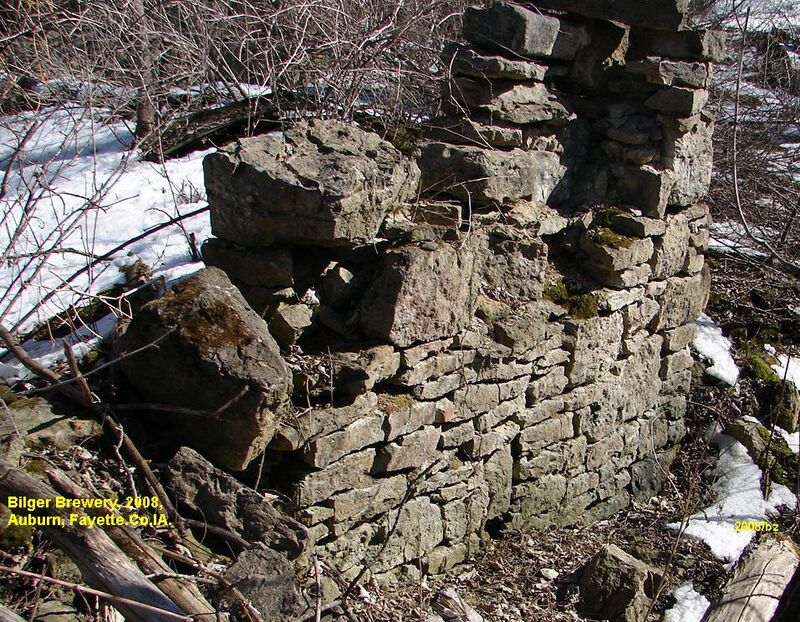 ...About 1856, the dam at thelower mill was burned out with quick silver or rather a hole was made in it and Daniel McDuffe as early settler there was arrested on the charge of having committed the act, but he was discharged and that was the end of the Matter. ...For several years the people of Auburn thought that a railroad would be built up the Turkey river and meetings were held for the purpose of encouraging such an enterprise but their hopes all proved vain. ...In an early day the justices of the peace in Auburn township were kept busy settling differences between the people there and the old dockets will show that more business was transacted before the justices in Auburn township than before those of any other township in the county. But within the last five years (1890-1895), it is safe to say there have not been a half dozen suits in the township. ...Like Goldsmith's beautiful village of Auburn, Auburn in Fayette County, is a thing of the past. Its mills are gone, the dam which was built across the Turkey to furnish the water for the mill has bee removed. The people who resorted there for business or pleasure go there no more. The hotel seldom sees a customer and all that remains of Auburn is Jenni McClerry, who is post mistress, has a general store, is a druggist and hardware merchant and supplies the wants of the few people who remain in Auburn. Its residences which were in early days tasty and well painted are not old, faded and decayed and the enterprise which formerly characterized Auburn, had departed. 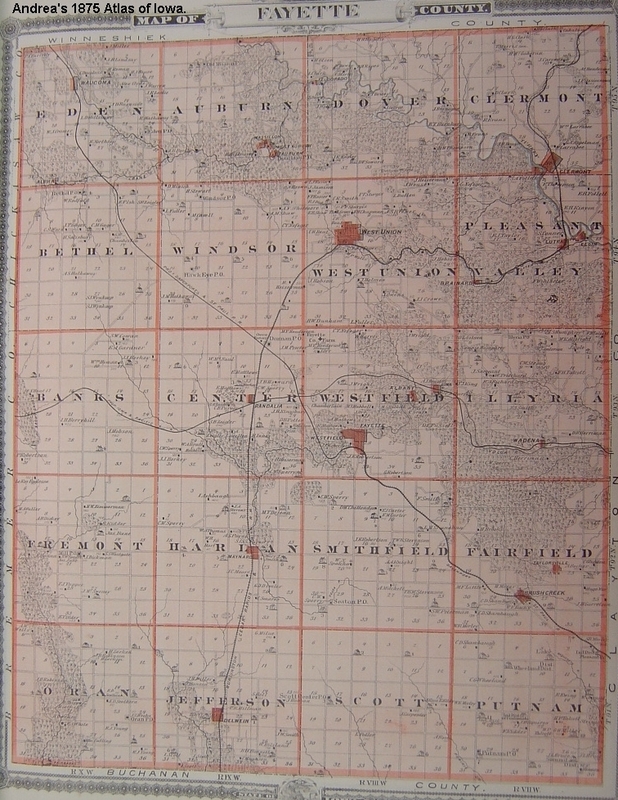 This is not due to any fault of its early settlers but from the fact that from its location it was deprived of the benefits of railroads and ceased to be upon any thoroughfare connecting it with other points. ...1855Mar05, Naturalized in Milwaukee, WI. ...1857about, Moved from Milwaukee.WI to the brewery business in Ft. Atkinson, Winneshiek.Co.IA. ...1858about, Ignatz Bilger started building a brewery in Bk17, N.Auburn, Auburn.Twp, Fay.Co.IA. .....Brewing would begin shortly after they moved to Auburn. .....The larger brewery complex, brick home & beer hall would be added within the early part of the 1860's, fully operational by the mid 1860's. ....1859, 1st child is born, Jospehine 'Josie' Bilger 1859-? (married James Thompson b.1851/Union.Twp, Fay.Co.IA). ...1859Apr, Fayette.Co.IA had 40 operational water or steam sawmills, some a combination of both. ......Bilger, Ignatz, family 191, 33y/Baden, Germany, brewer, $2000/200; Catherine, 25y/Wurtenberg, Germany; Josephine, 1y/Auburn, Fay.Co.IA. ......Andreas, Harmond, family 192, 28y/Saxon, Germany, brewer, $700/100; Margaret, 32y/Wurtenberg, Germany; William, 2y/Wisc. ...1864before, the size of the brewery grounds had increased substantially to include large limestone brewery, brew cellar, malt house, livestock & other out buildings, large brick home & beer hall. ...The Bilger Brewery was a large, major operation for the area/times. 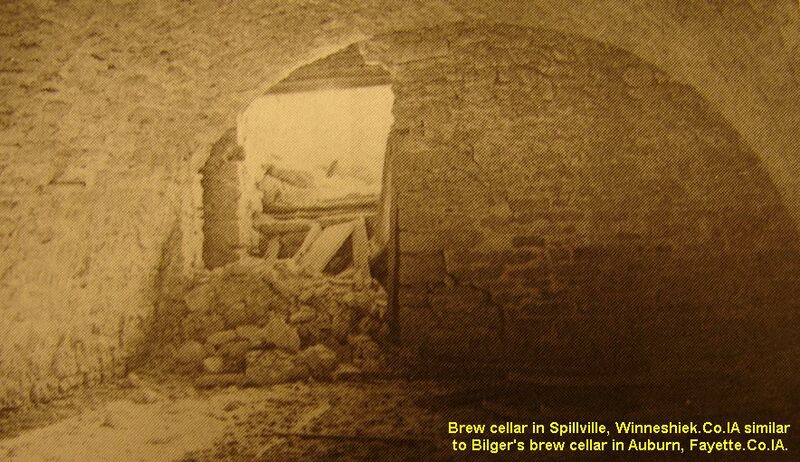 ......The Bilger brew cellar was a vaulted limestone room of about 12ft wide by 30ft long by 8ft high. The brew cellar was probably made by forming a dome of digging away soil to create a dome onto which a tight fitting limestone shell would be laid. After the key-stones at the crown of the dome were laid, the soil would be packed over the limestone dome, after which the soil in the dome would be removed. The procedure was commonly used by European builders. Then the floor would be created by laying tightly fitted flat limestone several feet below ground level. Generally no lime mortar was needed for this type of construction, which was very long lasting. The brew cellar would be warm enough in winter to keep beer from freezing and cold enough in summer to for aging and storing beer. ...German and Bohemian brewer's like Ignatz Bilger primarily produced a lager (lighter style) of beer, as opposed to the heavier ales which the English produced. Lager beer was generally brewed in the fall and early winter, then stored (lagered, lagering was fermentation at lower temperatures when the weather became cooler) undisturbed to age in a cool location. By spring time, after the beer had 'worked' it would be ready for sale/dringing. ...Barley was steeped in warm water for 2-3 days. ...The steeped barley was spread out on a wooden floor to germinate/sprout increasing sugars from the starches. ...Sprouted barley was dried, then roasted, becoming 'malted barely' higher in sugars. ...Following a curing period, the malted barley would be crushed to make it more soluble in a 'malt-mill' powered by an oxen or horse. ...Crushed, malted barley was mixed with water, 15gals/bushel; hops added for flavor & preservation. ...The mash of barley, water hops was then cooked, then added to a large wooden vat. ...Yeast was added to the vat and allowed to ferment and clarify, then kegged. ...The kegs of beer would be moved to the cool brew cellar for additional aging and clarifying, which was the lagering process. ...About 18gal of beer could be produced from a bushel of barley and 1/2lb of dried hops flower heads. ...About 1870, barley was 50c/bhl, hops 25c/lb, then the cost of wood, barrels, laborer. ...Beer sold in wooden barrels or buckets for about 30c/gal wholesale, up to double retail. ...1866Oct02, Dubuque.IA paper: Auburn, Fayette.Co.IA, 1866Sep28. Douglas is the name of the post office but the town is called Auburn. Located on on both sides of the Turkey river, surrounded by a chain of high bluffs interspersed with giant trees and huge rocks that tower up in majestic grandeur and sublimity. Aside from its wild and attractive scenery it is a town of some importance du to its splendid water facilities and the farming country around. There are two excellent flouring mills, situated a short distance apart. The upper one owned by McCeery and the lower on by Gardner & Son. Both do custom and merchant work, and supply a large section of the country with the finest quality of flour. There is also a good hotel, the Iowa House, kept by Mr. John Hadley, one drug store, two grocery stores, two dry goods stores, the principal one being kept by Fox & Son, and embraces, at least $20k worth of goods, one cooper shop, two blacksmith shops, one pottery, one brickyard, two lime kilns in operation, a first class chair & furniture shop, owned and conducted by that good fellows and good democrat, and one of the largest and most convenient breweries in all northern Iowa. Mr. Ignatz Bilger, formerly a brewer in Dubuque, is the proprietor of the brewery, and manufactures lager that has a reputation far and near. As a class, the people of Auburn are honest, industrious and intelligent. Twenty copies of the Dubuque Herald are taken to Auburn, and an effor is being made to increase the circulation to fifty. The number of voters in Auburn is over 200. The democratic majority is never less than 50 and sometimes reaches 75. 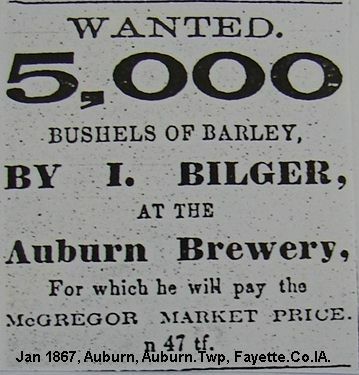 ...1867Jan10,West.Union Paper: Wanted, 5000 bushels of Barley by Ignatz Bilger at the Auburn Brewery, for which he will pay the (Mississippi port) McGregor market price. 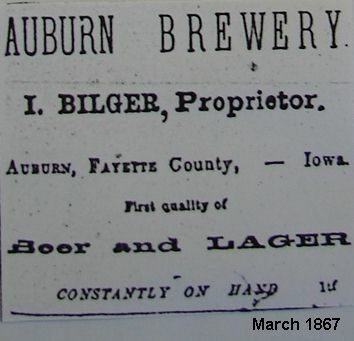 ...1867Mar28, West.Union Paper: Auburn Brewery, Ignatz Bilger, Proprietor, Auburn, Fayette Co, Iowa, First quality of Beer and Lager constantly on hand. ...1868Feb20, West.Union Paper, Auburn correspondent: We had the pleasure of being shown through Bilger’s Brewery not long since, and were well repaid for the walk through. The building is a massive structure. All its appointments are after the latest and most approved plans. ......Bilger, Ignatz, dwelling 66, the brewery, 42y/Baden, Germany, brewer, $30,000, 2000; Kate (Katherine), 36y/Wurtemberg; Josaphine, 11y/Auburn; Amelia, 10y/Auburn; Kate, 7y/Auburn; George, 4y/Auburn; Charlie, 1y/Auburn; Eleanoria, 1y/Auburn; Barney Heverly 26y/Baden, working at the brewery. ......Belknapp, Hiram, family 67, 70y/NY, shoemaker, living next door, likely just south of the brewery.j. ...1870 Ag.Census: Igntaz Bilger; Horse Malt Mill, $1500, 4600bu@$2200; Hops 3klb@$600; Brewer, beer 1500bbls@$12,000. ......Bilger, Ignatz, b. June 30, 1828, d. July 17, 1878, lot 25. ......Bilger, Katie, (b. Sept 10), d. Oct 6, 1878, lot 25, age 16y27d, dau of I. & M. (Ignatz & Mary). ...1878 Will Summary, Ignatz Bilger: Wife Katherine received control of the brewery estate upon Ignatz’s death. In 1889, upon the youngest children reaching age, 1/3 of the remaining estate went to wife Katherine, with 2/3 being equally divided between the children or their descendents. Book 1, page 164, Fayette Co, Iowa, dated April 16, 1878, probated Aug, 21, 1878, witnesses Wm. Cowle and E.B. Shaw, executors wife Katherine and West Union Attorney Joseph Hobson (of the Hobson pottery family that settled in Auburn in the early 1850’s and worked at the pottery on the west side of the Auburn plat before moving to a farm and setting up a pottery four miles south of Fayette village in the late 1850’s, bz). ...1880 Census, North Auburn, Fay.Co.IA: Bilger; Mary Catherine, dwelling 438, the brewery house, 45y/Germany, keeping house, widow of Ignatz Bilger; Josphine, 21y/Auburn, Fay.Co.IA; Emma, 19y/Auburn; Charles, 11y/Auburn; Elenora, 11y/Auburn. 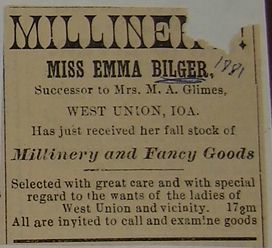 ...1881 Millinery in West Union: Emma Bilger, Successor to Mrs. M.A. Glimes, West Union, Iowa, Has just received her fall stock of Millinery and Fancy Goods. Selected with great care and with special regard to the wants of the ladies of West Union and vicinity. All are invited to call and examine goods on Main Street. ...1884Apr13, Josephine Bilger and James Thompson Marriage (West Union paper article): Josephine (Josie) Bilger of West Union (dau of Ignatz and Katherine Bilger of Auburn, Fayette Co, Iowa) married in Auburn, Sunday, April 13, 1884, as the residence of the bride’s mother, by Rev. C. T. Irish, Mr. James Thompson of Albert Lea, Minnesota. This was a quiet wedding, but nevertheless an event among the young people of Auburn and West Union. All join with us in bushels of good wishes for the happy pair. They have already gone to their home at Albert Lea. ......Bilger, Mary Catherine, dwelling 101, 51y/Germany, block 17, widow of Ignatz Bilger, brewer, son George, 20y/Auburn, daily laborer, living with mother so likely working the brewery. ......Ostenberger, Louis, dwelling 102, 45y/Germany, block 6, brewing, likely running the brewery for Mary Catherine Bilger. 1863Jul20, NE of NE, ex.#1, sec 35, Ignatz Bilger bought from Walter Whitbeck. 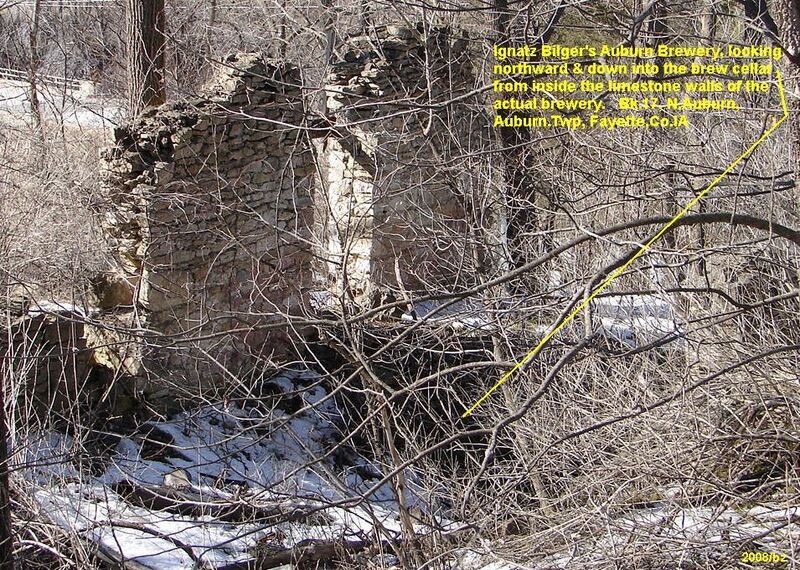 1866Feb28, S1/2 of N1/2 of S1/2 of NE1/4, sec 35, Ignatz Bilger bought from Isaac Robinson. 1871Jul18, Part of N1/2 of N1/2 of S1/2 of NE1/4, sec 35, Ignatz Bilger sold to Reul Parker. 1878, Ignatz Bilger passes away, his will leaves his wife Katherine in control of the brewery and all property until 1889 when she will get 1/3, and the children 2/3. 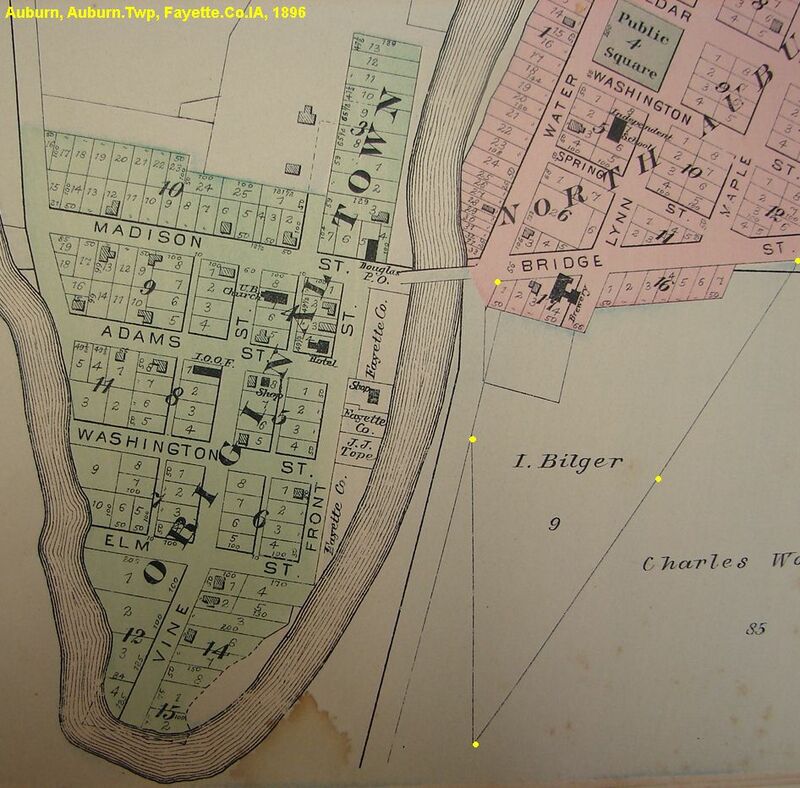 1881Jun27, NW1/4 in sec 36 & E1/2 of NE1/4 of NW1/4, Katherine Bilger bought from W.H. Dykins. 1884Oct27, S2/5 of S1/2 of NE1/4 of NW1/4 & N3/8 of S1/4 of NW1/4, sec 35, Katherine M. Bilger widow sold to Martin Fels. 1886Mar25, S1/5 of NE1/4 of NE1/4 & NW1/2 of SE1/4 of NW1/4, sec 35, Catherine Bilger bought from W.H. Dykins. 1889Apr15, W3/4 of NW1/4 of NE1/4, sec 35, Catherine Bilger sold to Luke Irving. 1897Dec03, NW10a of NE1/4 of NE1/4, sec 35, Katherine Bilger widow sold to Nora Edison. 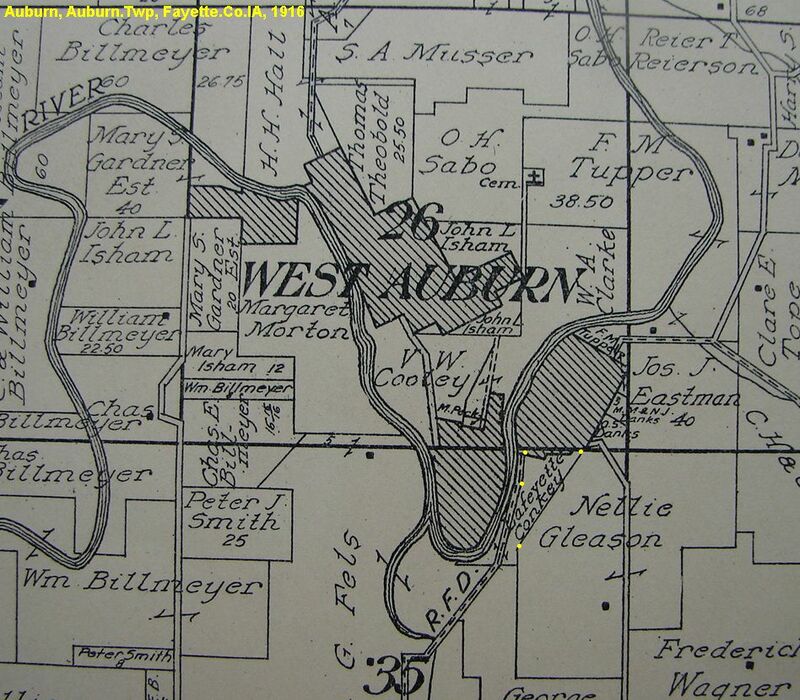 1898Jan, Blocks 12, 16, 17 and 6 ex lot 3, North Auburn, and NW10acres of NE1/4 of NE1/4, sec 35, Katherine Bilger sold to Nora Edison. (with some added explanation regarding brewing, people, locations, bz/2008). ...Almost half a century of disuse has left famous structures with only their memories. Where are the brews of yesteryear? There breweries have become still, while the stills are the breweries of today. ...Three buildings in Fayette County formerly used as breweries were still standing this summer in a fair state of repair, but in the last few weeks the old brewery building at Fayette village has been torn down to furnish building stone for the foundation of an attractive cottage (building). ...Its destruction leaving only the brick buildings at Auburn and Elgin standing to remind the inhabitants of the glory that was hops and the grandeur that was form. A sharp mental readjustment is necessary to make a suds factory fit into the Methodist and collegiate picture at Fayette, and indeed the date is so far back that hardly any recollections can be obtained even from old timers. ...Concerning auburn and Elgin more can be learned. The old buildings at Auburn may be seen o advantage from the county road. And while the one at Elgin is just at the edge of town. Both now are used for farm purposes. ...Long in Disuse: Almost half a century of disuse has left the once-famous structures with an appearance that indicates that the bottom has completely dropped out of the business, for near the two standing building can be seen just enough in the way of heaps of ruins to show that other buildings once stood there. Within a few years the scenes of social conviviality in the fifties, sixties, and down to the eighties will be entirely obliterated by the passage of time. ...The most famous establishment of its kind in Fayette County was the brewery at Auburn. 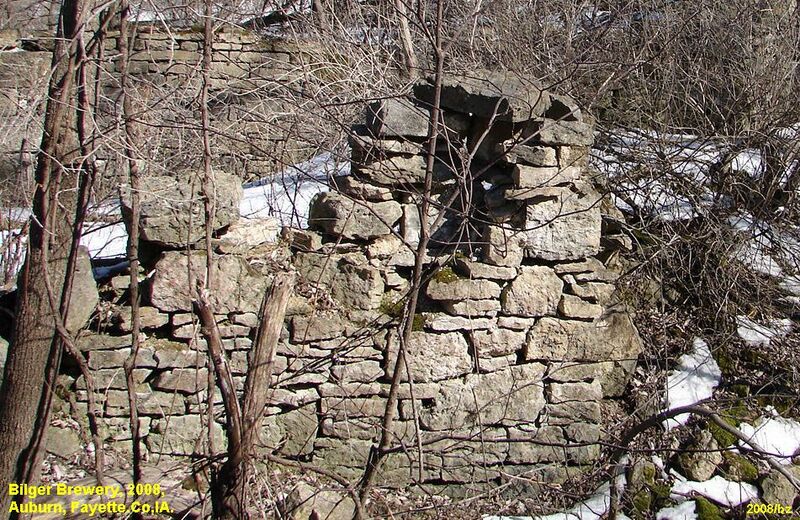 This was built by Ignatz Bilger in the early fifties (actually started by the late 1850's) on a high hillside above the Turkey River (overlooking Auburn village to the West & North Auburn to the north). 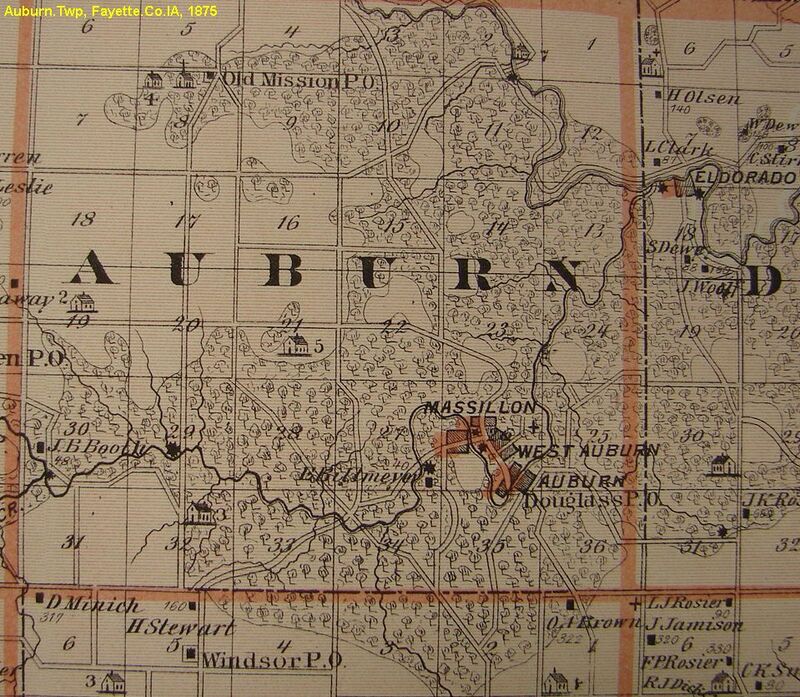 ...Auburn (in the 1850-1860's) was then the most thriving town in all Fayette County. ...This brewery was operated by Bilger till his death in the seventies (1878), and then by his widow (Mary Katherine) till the state prohibition law went into effect in 1884. ...Bilger furnished a market for all the barley grown for miles around Auburn, and in those days barley was one of the principal crops. ...He employed five or six workers in the brewery, and also ran two or three horse drawn wagons to Decorah and other points to delivery beer and lager. ...A by-product of this brewery was that of turning malted barley into good beef, for it was his custom to buy work oxen and fatten them for the market on the malted barley left from the brewing process. At one time fifteen of these beasts each weighing a ton or more broke out of their pasture and stampeded across the bridge from North Auburn and into the Auburn village. It was discovered later that the stone foundation of the bridge had been cracked when they passed over it. ...Breweries in those primitive days had to be built close to a spring to insure a water supply. The Auburn brewery spring, close to a hill top never froze. Not much evidence of this spring can be seen today for most of the timber has been removed, causing the spring to fail. 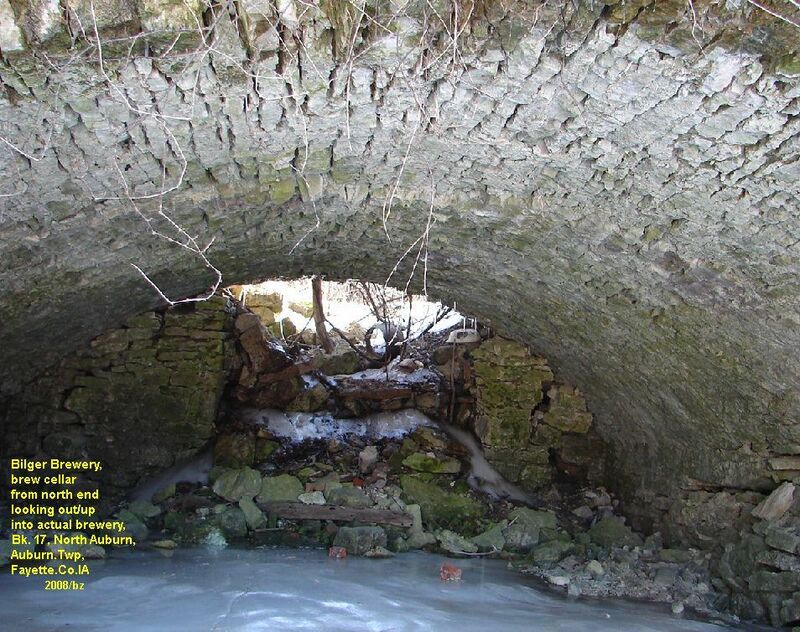 Water from this spring was piped (clay tile from the early Auburn pottery) by Bilger to the house and the brewery. 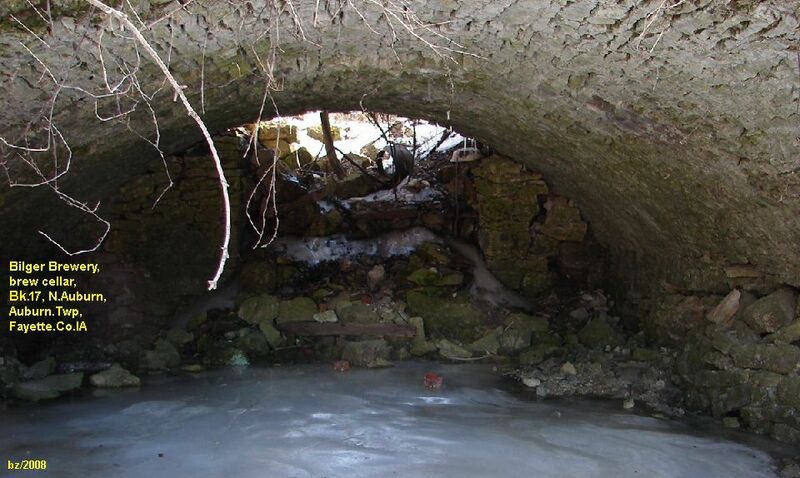 ...Through the tunnels (brew cellars) where the huge vats were kept the spring water flowed freely, and so deep and sheltered was this tunnel (cellar) that ice stood there even in midsummer. ...In the brewery house is still to be seen the old beer hall. This well built (brick) house will stand for many years. It now (1929) belongs to and is occupied by Franklin Downs, a Civil War veteran, who has lived in Auburn since 1849. 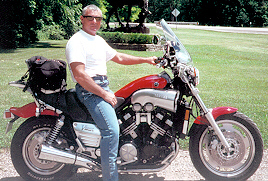 Mr. Down recalls many incidents connected with the brewery and with Auburn. It is said the Bilger drank a gallon of beer and a pint of alcohol each day. ...The Elgin brewery built in 1863, was operated until 1884. Schneider and Lehman were the first proprietors, but the place belonged to Nick Schori for many years. The brewery house, built by Schori in 1873, is well preserved, and is occupied by H.T. Knudtson and family. The old malt house is in good condition with the ruins of a larger building close by. ...Just when the Fayette brewery was built is unknown but possibly about the time the other breweries in the county were flourishing. Residents of Fayette recall that this part of town was known as ‘Crackervillle.' 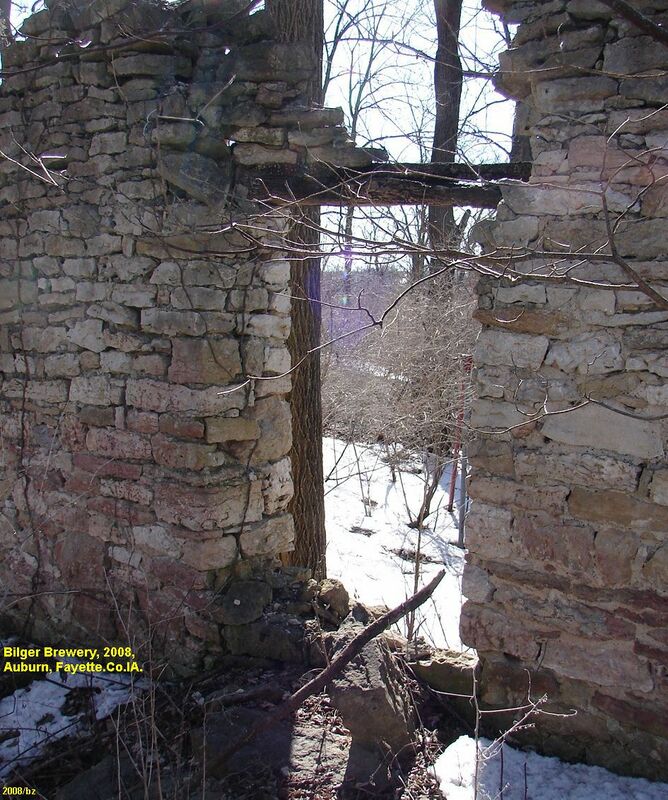 During one period while it was in operation it was illegal to sell beer except in connection with eatables, so the proprietor sold crackers and ‘gave away’ the beer to evade the law, hence the name ‘Crackerville.’ The remains of this building may be seen on Primary NO 11 (road north out of Fayette to West Union), just as one drives out of Fayette to the north (As this road, now old Hwy 150, crossed a creek, there was a spring coming from the hillside, off to the west of the road. The brewery was at the spring area. ...The Germans and Bohemians of Northeastern Iowa considered drinking beer a given right. ...Every village had an inn or if big enough, saloons and taverns. ...Demand for beer would generally support a brewery and any number of establishments. ...Brewing also supported barley, hops, cooperage production. ...Beer was a common beverage at the table of most Germans/Czechs. ...Early in its statehood there was an attempt by various interests to control alcohol use. ...The first Iowa liquor control was a the Prohibitory Law of 1855. ...After major opposition by the German/Czech settlers in 1858, the law was change to permit making and sales of beer, Apple Cider and wine from grapes, currants and fruits. ...Due to inability to enforce, the 1855 law was not functional and brewing and consumption continued. ...Generally were single room with several feet of earth above it. ...Cellars were generally vaulted (doomed) limestone rooms 12+/- feet wide and 20-30+ feet long, and perhaps 8 feet high. ...The floor would be tightly fitted limestone blocks. ...The cellar maintained a fairly even temperature throughout the year for aging and storing beer. ...The earth in the selected location was usually excavated down several feet to where the doom of the cellar would start. ...Then the earth would be dug/scraped away in the form of a doom,over which carefully shaped limestone blocks would be fitted together, using the earthen dome as a form. ...At the top of the dome carefully fitted keystone blocks were put in place to form a self supporting structure. ...Earth was then packed tightly on top of the limestone dome to the desired depth. ...The earthen ‘form’ inside the limestone dome was then removed. ...End walls and doors were built. ...Limestone mortar was sometimes utilized but in general the limestone blocks of the cellars dome were shaped so accurately that they were self supporting and mortar not needed or used. 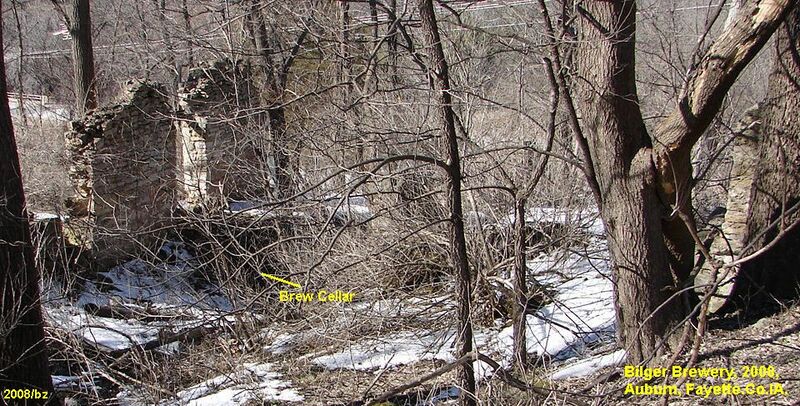 ...Not only brew cellars were made in this fashion but merchant and home cold storage cellars were constructed by some settlers, as were bridges and culverts. ...Water source was either a good hill spring, clear creek or even river water. ...Outbuildings were used for malting, mash pits, ice houses/coolers, storage, livestock fattening on malt mash. ...Like saw/flour mills, breweries often burned or were flooded. ...Size varied from large masonry and timber structures to smaller home/saloon level operations. ...Local and area depressions from early wheat, barely, rye crop failures such as those of the early 1870’s drastically impacted the economy and brewery operation. ...Most of the northeastern Iowa brewers had a German origin, with some Czech’s. ...The German/Czech region of Europe had developed a lagering process in beer production which required more time and brewing refinements, than the darker, heavier ale beers of England and Belgium. Both (lagers & ales) were produced in Iowa breweries but the German’s/Czech’s preferred lager beers. ...Lager beer requires low temperature fermentation so was brewed in the cool time of late fall and early winter. ...After brewing the beer was stored or lagered in large wooden barrels, often in a cool brew cellar being left undisturbed to age over the winter months. ...In the spring, after aging and settling the lager would be ready for drinking. ...Barley was steeped in warm water for 2-3+ days, then drained and spread over the wooden floor of the malt house to germinate. ...When the barley had been sprouted properly it was dried. ...During sprouting and drying brewery workers would consistently stir and turn the barley over with wooden rakes and shovels, often wearing wood shoes. ...After a short curing period the malted (sprouted and dried) barley was crushed in a ‘malt mill’ using the power of an oxen or horse which walked in a circle around the mill much like the ‘pug’ mills used to pulverize and mix clay for potteries. ...Crushing the barley malt made it more soluble when mixed with water at a bushel of malted grain to about fifteen gallons of water. ...Hops was added for flavor and to counter the sugary taste of the fermented barley malt. ...The ‘mash’ was then cooked and the liquid moved to a wooden vat. ...Yeast was added and the ‘brew’ allowed to partially ferment and clarify. ...The brew was then put into wooden kegs and moved into the brew cellar for aging or lagering. ...In 1870 the Spillville brewery of Seigle & Hnilicka, with one brew helper produced 8000 gal of beer from 600 bushes of barley and 300 pounds of dried hops. ...Barley was 50c per bushel, hops 25c per pound, labor $700, $490 for 70 cords of wood to fire the boilers. ...Beer sold for 30c per gallon. ...Net cost was $1865 disregarding other expenses and improvements. ...Gross sales had a potential to be $2400. ...Net profit as about $535 from which living expenses and capital improvements could be made. ...Basically one bushel of barely would produce 13+gal of beer, and the left over ‘mash’ could be utilized for hog and cattle feed so was either fed by the brewers or sold to local farmers or towns people. ...Pioneer brewing was an art form with quality and flavor depending on grain and malted barely, the flavor the hops gave the brew, cooking time/temperature, aging/lagering, etc. ...Brewing was an art form rather than a standardized science so every batch of beer was slightly different in taste and quality. ...In 1882 a prohibitory amendment was placed on the Iowa ballot which passed. ...The courts ruled the bill unconstitutional, followed by the general assembly of legislators enacting an even stronger law basically imposing absolute prohibition to go into effect July 4, 1884. ...Enforcement in the German and Czech was spotty and all but ignored around Spillville, but by the late 1880’s legal actions had started against saloons and breweries. ...The prohibitionary laws and movements coupled with rail transportation closed nearly all pioneer breweries by the late 1880’s.